Every Christian parent will readily affirm that their children are being raised in a “Christian home.” Probe a little deeper, though, and you’ll often find that what they really mean is their children are being raised in a “Christian culture.” Let me state what should be obvious, but doesn’t always seem to be—Christian activities and interests do not make a home Christian. Let me be more specific—a Christian home is never defined by what the children are doing…it is defined by what the parents are doing. Your child could read the Bible every day, listen only to Christian music, watch only Christian videos, read every missionary biography in the library, know a zillion memory verses, have only Christian friends, and never miss Sunday School or Bible Club, and yet still not live in a Christian home. Your children cannot do enough Christian things, no matter how good those things may be, to make your home a Christian home. Only you, their parents, can make your home a Christian home. 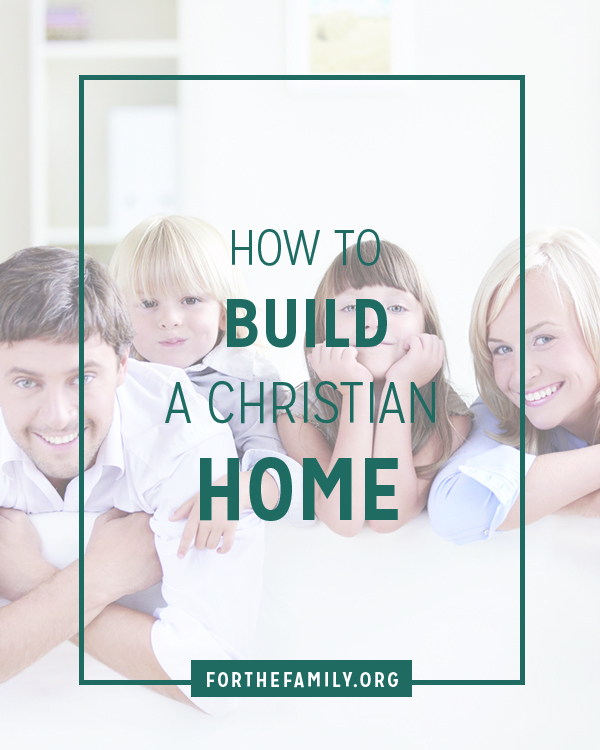 So What, Then, Makes a Home Christian or rather How to Build a Christian Home? A Christian home, in uncomplicated terms, is one in which God is alive and present in the lives of the parents. It is Christian not just in name, but in reality—Christ is present through His Spirit in the lives of His followers who live there. It is worth noting that the common Greek word in the New Testament for family is oikos, which means “house.” Family is the people who live within the house. A physical house built without a foundation is destined to fall. Only a firm foundation creates a real and lasting home. In the same way, Christ is the foundation of a Christian home. Just because Christians live inside a house does not mean that Christ is that home’s foundation. Jesus ended his sermon on the mount with the parable of “a wise man who built his house on the rock” (Matthew 7:24-27). His house stood against the wind and flood, but the house built on sand fell. As a parent, you must choose to build your own house, your family, on the rock of Christ and His word if you want to build a Christian home that will stand for God, both literally and figuratively. But how do you do that? Paul admonished parents concerning children that we are to “bring them up in the training and instruction of the Lord.” We are to ektrepho our children “in the Lord.” That Greek term literally means to “feed from,” or to nurture. We are to feed our children from the life of God that is already in our own lives, to nurture their hearts in the life of the Lord who already lives in our own hearts. Paul explains what that nurture looks like—it is helping your children understand the ways (training) and words (instruction) of life with Christ. Paul’s admonition to parents is not just a formula for what to do, but rather a description of the spiritual, relational, and life-giving priorities that should characterize our parenting. That is what will lay a strong foundation for a Christian home. And that is how you build a Christian home. It all starts with your heart. Clay Clarkson is Director of Whole Heart Ministries, a non-profit family ministry he and Sally started in 1994 to encourage and equip Christian parents. He is the author of Educating the WholeHearted Child, Our 24 Family Ways, and Heartfelt Discipline, and writes online at WholeHeart.org, PiecesofClay.com, and for other blogs. Clay is a graduate of Denver Seminary, and has served in church, missions, and parachurch ministries since 1975. He is also a Christian songwriter, acoustic guitar lover, Internet domain collector, and old Christian books enthusiast. Clay and Sally live in Monument, CO at 7,300 feet. All four children are grown and following Jesus in arts, music, film, and ministry. « Is It Enough To Correct Our Children (in Love)? Awesome words that we need to hear and apply to our lives and family ! thank you ! “a Christian home is never defined by what the children are doing…it is defined by what the parents are doing” Amen! My husband and I often talk about how the term “Christian” is thrown around so loosely in our culture that it is frightening. So thankful for your family’s ministry. I was going to say thank you to you and your wife but realized I’m thankful for your whole family; I have a book of Sarah’s on my nightstand and Joel’s CD’s often play in my home, bringing peace and beauty to our day. I so agree, great article indeed. Children live by the example they see, so we as parents must be a godly example for them. We must live like Christ. Amen! This is SO good! Thank you Clay! Just excellent. I couldn’t agree more. Thank you! SO TRUE! Thanks for writing this. I was blessed to grow up in a home where my parents spared no effort to live the Gospel and seek direction from our Heavenly Father. Thank you so much for sharing this..I am truly blessed. God bless your family! Great article. I hope n pray it will be embeded deep inside me.